This is a list of golfing terms used in Golf, NES Open Tournament Golf, Mobile Golf, Mario Sports Superstars and the Mario Golf series. A few also appear in the golf minigame in Wario Land 3. Waluigi, attempting to get his golf ball out of a bunker. Bunkers (sometimes known as "Sand Traps") are divots filled with sand. They vary greatly in size; they can be a couple of yards wide to close to the length of the entire course. When a golf ball lands in a bunker, it reacts much like rough since it traps the ball. It takes great effort to get the ball out of the bunker, and it can affect a playing score greatly. When the ball goes into a bunker, the announcer says "Oh, too bad!" in the Nintendo 64 Mario Golf game but nothing in the other games. Also, if the player scored par or better after their ball went into the bunker during a hole, this becomes a Sand Save, which is recorded in the Records. The Fairway can be seen in light green. The Fairway is the central path of each hole on the way to the Green. It usually covers about two-thirds of each golf course. Fairway has light green short-cut grass and has no effect on the golf ball. Fairway is the easiest part of the course to strike the ball from, for it is not deep and will not impair the player's shot. However, Fairway can be placed anywhere on the course; Thus, the Fairway can be on a hill, in a divot, by the edge of the course, or even in hard-to-reach places. This is the only part of Fairway that can impair the player's shot. Following the fairway is usually the safest and quickest way to the Green. Fast Fairway is a variation on the normal Fairway which, as the name implies, has the grass cut so that the ball will roll farther and bounce higher. The fast fairway is differently-colored from the regular fairway, signifying its place on the course. In Toadstool Tour, fast fairways appear on the courses Blooper Bay, Peach's Castle Grounds, and Bowser Badlands, and are brighter in color than ordinary fairways. In World Tour, fast fairways are seen only in the Seaside Course and have darker colors than normal fairways. The player will have to be careful when calculating where to shoot the ball if it is going to land on the fast fairway, since it can severely impair the player's score depending on how the ball reacts to the landing. Hitting a ball from out of a Flower Garden or Flower Patch affects a player's shot, making it shorter and lower. They are found in Mario Golf: Toadstool Tour on Peach's Castle Grounds and Mario Golf: World Tour on Peach Gardens. When a ball lands in a Flower Patch in Toadstool Tour, Pikmin may jump out. The Fringe is a narrow strip of grass surrounding the green, which is cut to a length between the fairway and the green itself. A golf ball on the green. The Green of the hole is where the Pin, Flag, and Hole are located, and as such forms the outer target players must aim for. The Green is usually surrounded by a Fringe. Golfers generally only use putters to strike the ball while on the green. The location of the hole always changes on the green. In the Star Tournament, the Green is replaced with Tournament Green. The Tournament Green is are variations of standard which Greens produce less friction on the ball, making it roll farther than when it lands on regular greens. They have appeared in all Mario Golf games since Mario Golf: Toadstool Tour. They are first found in the Star Tournament of that game as an additional challenge, but they can be used in any course once the player beats that course in the Star Tournament. In Mario Golf: World Tour, they only appear in Expert Tournaments, which are regional tournaments played without a flight path, and major world tournaments namely the Castle Tournament, Star Open, Moon Open, and World Championship. The hole is the name of each playing area within a golf course, and of the small circular pit in the ground which is the ultimate target (the latter sometimes referred to as the cup) of each one. In order to complete a hole, the player must sink the golf ball in the cup, which is located on the Green. The Pin sticks out of the cup to indicate its exact spot. In Mario Golf: Toadstool Tour, a cup can sometimes release special particle effects, especially if golfers successfully putt from a certain distance and score under par. In Mario Golf: World Tour, flashes of light come out of the cup if golfers score par or better. When golfers are not yet on the green, the cup glows with a ray of light to signal them of its location. The hole releasing particle effects. Toad alerting that the ball is Out of Bounds in the intro of Mario Golf (N64). When a player hits a shot Out of Bounds (abbreviated as O.B. ), it means that their golf ball landed outside the boundaries of the golf course. When the player hits the ball where it lands outside of the boundaries, falls off the edge, lands in lava, in a Chain Chomp pit, or elsewhere that is not in the main course, it is registered as Out of Bounds. Some sort of signal usually appears when the player hits Out of Bounds. The penalty for going Out of Bounds is one stroke, added on to the player's current score for the hole. The player must then hit the ball from the same place that they hit the Out of Bounds shot. In NES Open Tournament Golf and Mario Golf for the Nintendo 64, Toad is the one to alert the player of an Out of Bounds shot, while in Mario Golf: Toadstool Tour, a Koopa Paratroopa is the one to alert the player. When an Out of Bounds shot happens, the announcer says "Oh, too bad!" except in Mario Golf: Advance Tour and Mario Golf: World Tour. In the former, nothing is said in the case, while in the latter, the announcer says either "Out of Bounds!" or "Too bad!" instead (where Blue Toad holds up an OB sign). The Pin is visible sticking out of the Hole. The Pin, also known as the Flagpole marks the location of the Hole, and the Flag is used to make it stand out a little more. Whenever the ball hits the pin, that would be called a "Pin Shot", usually making balls bounce back. The Pin is removed when players make shots on the Green, so that the ball can enter the hole more easily. Rough in Mario Golf: World Tour. Semi-Rough is a shallow type of rough that looks very similar to the Fairway. Though hardly visible, the Semi-Rough will slightly impair the player's shot out of the patch, making the ball not go as far or land in another place. It is usually the edge boundary between the fairway and the rough. Terrain that does not have much friction and causes balls to bounce out of it. When a ball lands on it, it hurts the ball's lie, though not as much as Grass Bunkers or Heavy Rough. Standard Rough is in almost every course. It looks like much thicker blades of grass (when compared to the fairway). Rough is usually located near the Fairway or near a Bunker. Rough will impair the player's shot out of the patch, making the ball land in a completely different place than where planned. Heavy Rough (also known as Deep Rough) is the deepest and most dangerous type of Rough available on a course. It appears as very deep grass and is usually located near the boundaries of the course. Heavy Rough severely impairs the player's shot out of the thick patch; it usually takes a high shot to get the ball out, though it lands only a few yards away. When the ball goes into the rough, the announcer says, "Ooh, into the rough!" A ball in the Heath in Mario Sports Superstars. Heath is a type of rough in golf that affects the lie of the ball the most heavily out of all types of roughs, including the Heavy Rough and Bunkers. Players cannot hit the ball very far when in the Heath, the power meter charges up more quickly when starting a swing, and the sweet spot gets heavily lowered for the harder hitting clubs such as wood, to the point that if the player does not align the bar properly in the perfect spot, they duff the ball. This terrain first appears in Mario Golf for the Game Boy Color and Mario Golf: Advance Tour, appearing on the Coo-Coo Course and the Links course. In Mario Golf: Toadstool Tour, this hazard is found only in Bowser Badlands, and it appears in either the outside of edges of the course or as small patches interspersed in the Fairway. The Heath reappears in the Gold Links course of Mario Sports Superstars, replacing some of the Heavy Rough with the Heath. lands too close to a tree trunk. The penalty for aiming at a tree is the same as a regular Out of Bounds shot. However, if a ball goes into a tree, the player has to hit the ball from wherever they aimed it from. Lakitu alerting the player of a Water Hazard. The Water Hazard is a body of water on the course. The penalty for hitting into a Water Hazard is the same as a regular Out of Bounds shot. However, if a ball goes into the water, the player must hit the ball a yard or two from the edge of the nearest land area from where the ball entered the water; this is called a Drop. The announcer says "Oh, too bad!" except in Mario Golf: Toadstool Tour and Mario Golf: Advance Tour. When the ball lands on wooden decking in Mario Golf: Toadstool Tour, it is said to land on Wood. Similar to Rock, Pipe, or Brick, the ball frequently bounces off of it. Like those three terrains, it also hurts the ball's lie. They are not in specific areas of a golf course. For example, if the ball is in front of a tree and cannot go straight to move on the course, it is not a formally unplayable area, even if a player faces difficulty in playing it. Rock and flower patches do not count as an unplayable area. However, if the golf ball stops at a wooded area such as a Cabin or a Bridge (Bowser's Castle of Hole 4 in Mario Golf: World Tour), they are considered an area where wood is an unplayable area. The golf ball is safe to land of the white bridge of Hole 9 of Forest Course and holes 9 and 14 of Seaside Course. The text the "Unplayable" message appears in is shown in purple. Luigi receiving his Albatross in Mario Golf: World Tour. An Albatross (also called Double Eagle) is a score of three under Par for a given hole. Albatrosses are extremely difficult to perform, and usually require a character that can shoot the ball a great distance to perform them (such as Petey Piranha or Metal Mario). Albatrosses are usually done by means of Chip Ins, though on some Par 5 holes, depending on wind conditions, it is possible to land on the Green from the tee box, and then by sinking the Albatross Putt to get an Albatross without a Chip In. In the Club Slots mode in Mario Golf: Toadstool Tour, an Albatross gives the player 5 points. When played by Point Play rules in Mario Golf: World Tour, Albatrosses are worth 8 points, which are worth the same as a Hole-in-One. In Mario Golf for Nintendo 64, if the player gets on the Green in one stroke on a Par 5 hole, they will receive the Albatross Putt message in rainbow colors when they start their putt, while they are rainbow-colored on the Score Card. They are given a golden color in the Mario Golf: Toadstool Tour Score Card. In Mario Golf: Toadstool Tour and Mario Golf: Advance Tour, the color of Albatross Best Badges are red. Baby Luigi receiving a Birdie in Mario Sports Superstars. A Birdie is a score equal to one below Par. Birdies can be achieved on all holes and any character can achieve them. In Mario Golf: Toadstool Tour and Mario Golf: Advance Tour, Birdie Best Badges are blue, whereas in Mario Golf: World Tour, they're Silver. In all games, every time characters get a Birdie on a hole that they have not got a Birdie result in during a Tournament, they will get one Birdie Badge. Earning enough Badges can unlock content, depending on the game that is being played. In the Score Card, Birdies are colored Orange in the Nintendo 64 version of Mario Golf, while they are half-white, half-red in Mario Golf: Toadstool Tour. This is the lowest score that earns the player a Birdie Badge in Tournament mode. When playing Club Slots in Mario Golf: Toadstool Tour or by Point Play rules in Mario Golf: World Tour, a Birdie gives the player 3 points. 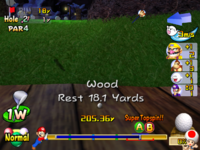 The Birdie Challenge mode in Mario Golf: Toadstool Tour requires the player to get a Birdie in each hole, otherwise they will fail the challenge. Baby Mario dissatisfied with his Bogey. There are many degrees of bogeys, though they are all considered bad scores. There are ten types of bogeys, but only three are actually called so. A normal bogey is a score that is one over par - e.g., the player gets the ball in the hole with six strokes on a par 5 hole. The player's character shows disappointment of their score at the end of the hole. When playing Club Slots in Mario Golf: Toadstool Tour or by Point Play rules in Mario Golf: World Tour, a Bogey gives the player 1 point. In the Score Card, Bogeys are Green in Mario Golf for the Nintendo 64 and half-white, half-blue in Mario Golf: Toadstool Tour. As the player takes more strokes over par, additional bogeys such as double, triple, and so on, occur. This feature only becomes used in games after Mario Golf: Toadstool Tour. The terminology changes to digits once the fourth stroke over par is taken (+4), second stroke over par (+2) in Mario Golf for the Nintendo 64, or the third stroke over par (+3) in Mario Golf for the Game Boy Color. This goes up until +6 in Par 3 holes, +8 in Par 4 holes and +10 in Par 5 holes. By that time, the player cannot take any more strokes, and the hole automatically ends with a Give Up. When playing Club Slots in Mario Golf: Toadstool Tour or by Point Play rules in Mario Golf: World Tour, a Double Bogey or lower score is worth 0 points. In the Score Card, scores of Double Bogey or worse are indicated in Blue. In Mario Golf: Advance Tour, if the player takes a +4 or worse score or gives up on a hole, the announcer says "Oh, too bad!". This is the only game in which the announcer says something for a score of +4 or worse while other games have the announcer say nothing. If the player takes too long to finish the hole and takes a number of strokes equal to three times the par of the hole, the player will be forced to give up and get a +6 (Par 3 hole), +8 (Par 4 hole) or +10 (Par 5 hole). Players can also give up in a hole after the 1st stroke, but that also means the player will get a +6 (Par 3 hole), +8 (Par 4 hole) or +10 (Par 5 hole). Every game will display a GIVE UP sign in case of giving up, except in the N64 game and Mario Golf: Toadstool Tour - in the former game, no score is displayed in case of a Give Up, while the latter game displays +6, +8 or +10 depending on the Par value of the hole. The music that plays upon giving up on a hole is the music for a Double Bogey or lower, except in the N64 game and Mario Golf: Toadstool Tour, where the music that plays in a Give Up is when the player loses a hole in Match Play or fails a Ring Shot. In case of Match Play, a Give Up will result in an automatic loss to the player, in which the other player will automatically win the current hole. 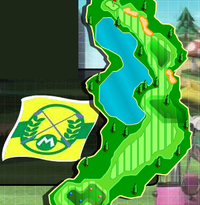 In the online mode of Mario Golf: World Tour, timing out during a turn will also force the player to give up. Yoshi in Mario Golf for Nintendo 64 Note: The animation for a Double Bogey or lower (as well as giving up) is the same as the Bogey animation for this game. Double bogey in the PAL version of Mario Golf: Toadstool Tour. Waluigi receiving a +4 in Mario Golf: Toadstool Tour. Mario receiving a +6 in Mario Golf: Toadstool Tour. Wario receiving a +7 in Mario Golf: Toadstool Tour. Donkey Kong receiving a +8 in Mario Golf: Toadstool Tour. Daisy receiving a +10 in Mario Golf: Toadstool Tour. Baby Luigi receiving an Eagle in Mario Sports Superstars. An Eagle is a score that is two below par, which improves the player's score by 2. Eagles are scored by a Hole-in-One on a Par Three hole, a 2 on a Par Four, or a 3 on a Par Five. In Mario Golf: Toadstool Tour and Mario Golf: Advance Tour, Eagle Best Badges are green. In the Club Slots mode in Mario Golf: Toadstool Tour, Eagles give the player 4 points. When played by Point Play rules in Mario Golf: World Tour, an Eagle is worth 5 points. In the Score Card, Eagles are colored Red (Par 5 holes) or a rainbow type (Par 4 holes) in the Mario Golf for the Nintendo 64, while they are solid red in Mario Golf: Toadstool Tour. Pink Gold Peach scoring a Par in Mario Sports Superstars. A Par is the anticipated average score for a hole, and represents a score of ±0. When the player gets a Par, their character reacts mellowly, showing happiness that they didn't do bad, but slightly disappointed that they didn't do better. The Nintendo 64 version of Mario Golf colors Pars in White on the Score Card while Mario Golf: Toadstool Tour colors Pars in Green on the Score Card. This is the highest score that will not earn the player a Birdie Badge in Tournament mode. In Ring Shot mode, a Par is required for all holes, otherwise the player will fail the hole, even if they shot through all the rings in that hole. When playing Club Slots in Mario Golf: Toadstool Tour or by Point Play rules in Mario Golf: World Tour, a Par will award the player 2 points. The player will fail Birdie Challenge in Mario Golf: Toadstool Tour by getting a Par or lower score. When playing the Cash Cup mode in Coin Attack on Mario Golf: Toadstool Tour, a Par is required, otherwise the player will lose all coins earned in that hole. 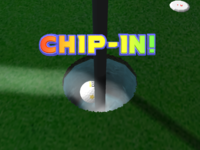 A Chip In in Mario Golf: World Tour. A Chip In (also called Chip-In) is a shot that results in from the player striking the ball into the air, not from the green, straight into the cup. If the player strikes the ball from a Bunker or even the Fairway and gets it in the cup, it counts as a Chip In. The player gets no extra turns, points, or powers for performing this; it is merely a signal of how well the player is doing. Because of how it is defined, a Hole-in-One is considered a Chip In. A Flag Shot is an event where the player's golf ball hits the flag on the pin sticking out of the hole. The player will only know if the golf ball has hit the flag by a sound effect that plays when the ball makes contact with the flag. It does not affect the player's score or power-ups. Metal Mario receiving a Hole in One in Mario Sports Superstars. A Hole in One is the most difficult shot to achieve - in order to do so, the player must get the golf ball in the hole with one hit (hence the name). A Hole in One can be performed on any hole - they are easiest to perform on Par 3 holes, but they can be performed with more difficulty on Par 4 and 5 holes as well. Usually, only high-powered characters can perform this move. In case of Hole-in-Ones, one less the Par value of the hole is subtracted from the player's score for the course (Par 3 = -2, Par 4 = -3, Par 5 = -4). They are typically shown in place of the actual hole score in the end of hole animation. A Hole-in-One on a Par 5 hole in Mario Golf: Toadstool Tour. It is actually a Condor in this instance as it reduces the player's score by 4. In Mario Golf: Toadstool Tour and Mario Golf: Advance Tour, Hole in One Best Badges color are yellow. The US version of Mario Golf: Toadstool Tour has errors in identifying Hole-in-Ones: getting them on a Par 4 or Par 5 hole will display it as an Albatross, even though Hole-in-Ones on Par 5 holes reduce the player's score by 4 (like a Condor would) and not 3. Results like these are put under "Albatross" in the Highlights section. Hole-in-Ones done on Par 4 or Par 5 holes in the European and the Japanese versions of the game register correctly. Results like these are put under "Hole-in-One" in the Highlights section. In case of Club Slots in Mario Golf: Toadstool Tour, a Hole-in-One is worth one point more than the Par value of the hole. With Point Play rules in Mario Golf: World Tour, a Hole-in-One is worth 8 points, which is worth the same as an Albatross. In Mario Golf for the Nintendo 64, Hole-in-Ones are rainbow-colored on the Score Card, while they are a golden color in the Mario Golf: Toadstool Tour Score Card. Note: All these animations are the same as an Eagle and Albatross. Eagle is different on GBC. "Nice Shot" redirects here. For information about the Mario Party 6 minigame whose internal name is "Nice Shot! ", see Freeze Frame. A Nice Shot is a common event - in order to get a Nice Shot, the player must strike the golf ball with enough strength and stop the meter bar in the sweet spot zone. By getting a Nice Shot, the golf ball is more likely to go on a perfect path, going where guided to. 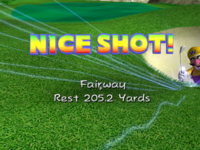 The words "Nice Shot" appear in large colorful letters, alerting the player that they had done well, but the player does not earn any extra points, powers, or turns for performing this move. When this is achieved as a perfect power shot, the number of power shots will not decrease. 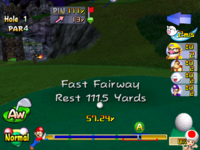 In Mario Golf: World Tour, a Nice Shot is achieved if the rising and falling bar is stopped exactly at the markers of the power meter, (a sound effect will confirm this) giving Miis' and Mario characters' golf balls gold and rainbow streaks respectively, in flight. Otherwise, it is only a "Good Shot". A Nice Shot from the tee will make an inset at the bottom right of the Nintendo 3DS top screen appear, showing the character doing a gesture of joy. However, a stroke will not be called a Nice Shot or a Good Shot if the ball does not end up on the green, the fringe, or fairway. 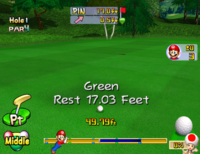 In Mario Golf for the Nintendo 64, a "Nice Shot" is not called when the ball is heading out of bounds or has its distance significantly reduced. A Pin Shot is an event which occurs when the player's golf ball hits the pin that resides in the hole. The player gets no extra points, turns, or power-ups for performing this move. It is merely pointed out when the shot is made. When the player makes a Pin Shot, the words "PIN SHOT!" appear in big letters on the screen. The announcer also says "Pin Shot" at this time. In the Mario Golf for the Nintendo 64, a Ukiki slides down the pin and makes a sound if a Pin Shot is performed. If players do a glitch on Bowser Badlands where they get Negative Strokes as a result of using mulligans after shooting from the Thwomp, it is possible to get a score better than -4, which results in the announcer saying "Complete!" and the hole played being the last hole of the match. The Double Bogey music plays if the player gets a "Complete!" as a result of doing the glitch. If no controller is connected to the Nintendo 64 when powering on Mario Golf for the Nintendo 64, the Double Bogey music plays while there is text saying "Turn OFF the power and connect a controller." This never happens in the Virtual Console releases. ↑ The Fore message being said right after the ball is hit. ↑ Water Hazard in Mario Golf: World Tour. This page was last edited on March 9, 2019, at 21:37.